Heroes of Might and Magic II Gold Game Review - Download and Play Free Version! Grab your Sword, Call in the Troops and Get Ready for the Fight of Your Life in This Strategy Classic! 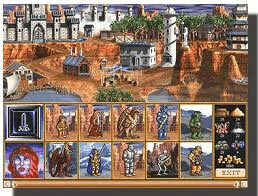 Heroes of Might and Magic II Gold gives you the classic strategic military game of war and action. 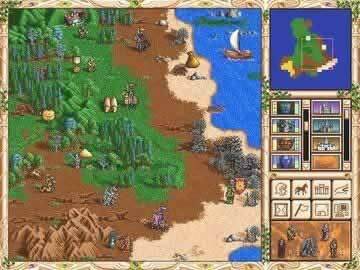 You get a bundle of Heroes of Might and Magic II, Heroes of Might and Magic II: Prince of Loyalty and 25 new maps totaling over 100 maps in all. This game combines RPG gaming with military strategy with resource management and simulation. 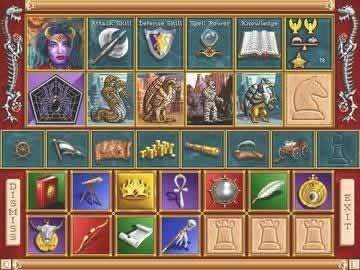 With all of these different genres mixed into one fantastic game, you are sure to get addicted to Heroes of Might and Magic II Gold. Which Side of the Battle Will You Choose? Former Ruler of Enroth Lord Morglin Ironfist is dead and his feuding sons have caused a civil war over his former kingdom. Choose to side with the the evil son Archibald who brutally exiled his own brother Roland to take the thrown. Or you can choose to side with Roland who has formed a resistance against his villainous and tyrannical brother. Choose Standard mode or Campaign mode. Standard mode gives you the objective and ends the mission after you complete the objective. Campaign mode lets you call the shots and set your own objectives to complete. This is a customizable version of the game that lasts as long as you want. Both game modes also are equipped with a range of difficulty from easy to hard. Play With Characters from History and Myth! Choose from a variety of characters from ancient civilizations and myths including: knights, wizards, sorcerers, barbarians, necromancers, warlocks and more. All characters take some amount of wit and strategy to succeed. Now Create Your Own Maps! With the interactive map editor you can create you own world. Construct your own map for whatever kind of objectives you want. Get points and gain experience points by solving puzzles, finding lost artifacts and treasures, and simply exploring the huts and buildings around Enroth. Most of these discoveries will result in good things like a new spell to cast or a 1000 experience points, but others will not so beware. In Campaign mode choose from objectives titled: "Voyage Home," "Wizard's Isle," "Prince of Loyalty," and "Descendants." Don't hesitate to try the multiplayer options too. You can play with friends on one computer or connect to other players over the internet. Heroes of Might and Magic II Gold is a classic. Get it now and play a timeless strategy masterpiece! Heroes of Might and Magic II Gold is a fantasy based strategy military game that continues the addictive and fun gameplay of the original while adding tons of new features. Heroes of Might and Magic II Gold gives you not only Heroes of Might and Magic II but the expansion, Price of Loyalty, as well which means you have over 100 maps available to explore. The gameplay still consists of the same system of controlling hero units around a grand adventure map with a turn-based system, collecting resources, recruiting armies of fantastic creatures, casting a variety of spells, and with the ultimate goal of capturing all the enemy castles on a map. The graphics are greatly improved from the original title and do a great job of drawing you into the action. In addition to the previous hero classes, which include Warlocks, Sorceresses, Barbarians, and Knights, there are now Wizards and Necromancers under your command. There are also new creatures which you can recruit for your army, like stone-flinging Halflings, Giants, Vampires, Lichs, and Bone Dragons. Add into this fact that your castles have many new upgrade options, such as protective phenomena like the Barbarian's coliseums which raises the morale of your defending troops, the ability to assign captains to magically protect your castles while your heroes are out adventuring, and upgradeable monster dwellings to make your units even stronger, and there are whole new layers to the strategic avenues you can explore. Let's not forget about the spells either, and there are plenty to whet your appetite. For starters, there are adventure spells which you can use on the world map to perform all kinds of actions such as the “haunt” spell which allows you to leave ghost-guardians in mines and “visions” which let you determine if a neutral creature you encounter will join your ranks. Then there are the combat spells which help you to decimate your foes such as “chain lightning” to knock down several enemies at once. There were a few small issues though, such as the fact that the original game's mission tended to get a little monotonous since the objectives are mostly the same for every one and pretty much once you found a decent strategy you could tackle most of the missions. The expansion pack, Price of Loyalty, does a decent job of mixing things up with new mission parameter and objectives to make up for this though. Also, the multiplayer mode is a nice feature but the games can take several hours to actually complete and may be a bit too much of a commitment. Overall, Heroes of Might and Magic II Gold greatly improves this classic game series and does a great job of balancing a variety of strategic elements. The interface is very easy to use and the option to auto-battle means this is a great title for new players, and the new features add an even greater level of depth to the strategy and combat that is sure to appeal to more experienced turn-based strategy fans. Player created video showing basic gameplay and battles.